There had been very little food that day in the Benito Juarez shelter for the estimated 5,000 to 7,000 migrants who had gathered in Tijuana, Mexico, at the end of the journey they had taken from their hometowns in El Salvador, Guatemala, and Honduras to reach the U.S. - Mexico border. The port-a-potties had overflowed and the smell was "a little bit off” said Ada Trillo, a Mexican-American documentary photographer who had been traveling with the migrant caravan since October. The threat of rain was shown by the dark clouds on the horizon, which endangered the migrants’ carefully constructed shelters. Trillo was snapping away, as she always does. She was there “to work, not to chill,” and that meant getting up early in the morning and photographing until everyone went to sleep, which sometimes was one or two o’clock in the morning. 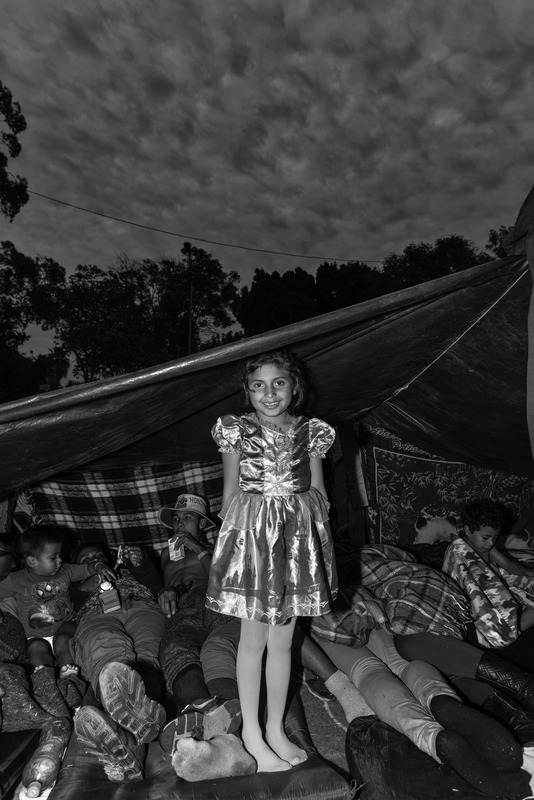 But while taking photos of a migrant family sleeping in a tent, a little girl came up to Trillo, wearing a princess dress that she had managed to grab from the donation pile at the shelter that day. 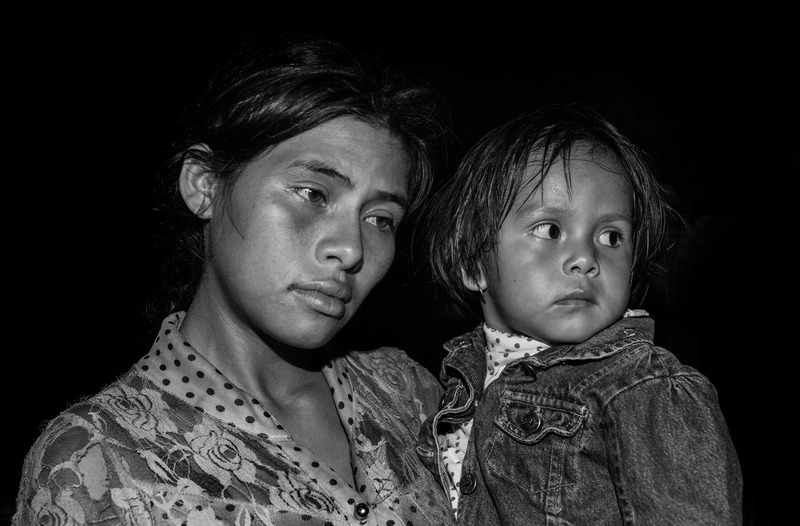 The resulting image that Trillo captured of “La princesa,” as the photo is titled, now hangs in the “Chasing Freedom: Migrant Caravan Portraits” exhibition of the photographer’s work, on display at Gershman Hall, University of the Arts, until April 25. It stands as a testament to the human connection inherent in Central American migrants’ journey that Trillo has sought to introduce through her photos. In the black-and-white image, the young girl stands in front of sleeping family members and other migrants. She is posing, with a bright smile, showing off the satin dress with a puffed skirt that she is wearing. Behind the tent covering, you can see a cloudy sky. “That was her day. And it was something so simple because...her family had absolutely nothing. Something so simple as a used princess dress that brought her so much joy,” she continued. Trillo’s photos are striking in their depiction of joy in the midst of the hardships endured by migrants who traveled in the caravan. Depicting that joy, Trillo said, goes to the heart of ensuring that her photos are ones that document the situation of migrants, in all of its suffering and challenges, but do so while acknowledging the humanity of each individual. “You want to bring awareness to what’s happening but you want to do it in a way that is right; in a way that doesn’t offend anybody by any stretch of the imagination,” Trillo said, adding that giving people dignity is an inherent part of her process. “If the shot doesn’t do that then it wasn’t a good shot, and it was a mistake on my part. And I made many. So it’s choosing those [photos] that give dignity,” she said. “It’s not just a number. It’s a little face. Or it’s a grown-up face. But it’s a face. It’s a journey. It’s a struggle. And there has to be empathy, there has to be respect,” Trillo said. “You’re putting a seal on a moment in time. And what’s happening in history right now is very important and very unfortunate,” she said. “He showed me a picture from his phone, and I was like, ‘holy moly...I’ve never seen something like this.’ There were caravans before, but they were up to 1,000 people. Never of this magnitude,” said Trillo. She documented the whole trajectory, starting in Tapachula, Mexico, at the border with Guatemala, on Oct. 20, and traveling with the caravan to Tijuana, at the U.S.-Mexico border. Trillo said that even before that, she had been motivated to do a project on immigration since Trump started his presidential campaign and began maligning Mexicans who had immigrated to the U.S.
“I wanted to do something to show the trajectory, so people could understand how hard it is, and how painful and sometimes deadly, the trajectory is, in search of that hope of a better life….Then they come here, they’re not respected, many times they’re now being separated from their families,” said Trillo. Her photos are, as she puts it, “my little grain of salt” to illuminate another viewpoint, and a different understanding, of immigrants who come to the U.S.
“The majority of people that come to this country are from both Mexico and Central America, which is what I can speak for, are people that come to work, or are refugees, asylum seekers with one fear or another. That needs to [be] put into attention. But the majority of people that come here are not criminals; on the contrary they come to make this country better, they take the jobs that nobody wants, or that very few want, and they do it for a lower fee because the minimum wage doesn’t apply to them,” said Trillo. Trillo noted that it was difficult to witness the struggles of people that she not only photographed, but grew close to emotionally. Towards the end of her time staying with the migrant caravan in 2018, Trillo wanted to physically help some of the people in the Benito Juarez shelter. She organized a Go Fund Me campaign to collect donations for baby formula, which the shelter had run out of. She raised more than $1,000 and was able to get supplies to the shelter in a fully transparent way. Now, a portion of the proceeds of her photos will go to the Minority Humanitarian Foundation, which is working on both sides of the border to help migrants. Trillo said she has to balance what she can do for those she has met and formed ties with while documenting the caravan with her role as a single mother, but she is moved to take action beyond the act of photographing and documenting the migrants’ experiences. Her identity as a Latina photographer and as a mother is one that American journalist Sam Slock, who worked with Trillo in creating videos and documenting stories in the caravan in the fall, said is one that adds dimension to her work. “Her work just by the nature of who she is takes this way beyond clickbait...money-shot journalism, which was what so many people down there were doing, mainstream coverage, and so just by the nature of her, and who she is, she’s tapping into that,” Slovick said. Both Slovick and Trillo said that they plan to return to Tijuana to further document the stories of those who traveled in the caravan and have been deported back to their home countries, remain in Tijuana, or are continuing their immigration journey in the United States. “The caravan hasn’t ended, there’s still people there, there’s not a lot of people covering it but it’s there, people need to know the circumstances,” Trillo said. The opening reception for the exhibit will be held April 5, from 5 - 7 p.m. at Gershman Hall. A talk with the artist, Ada Trillo, immigrant advocate Christina Martinez and documentary filmmaker Sam Slovick will be held from 4 - 5 p.m.